Chip in to support Ruairí McKiernan's campaigning, writing, podcast, mentoring and social change work in the world. 100% of funds re-invested in promoting positive social change. All donors receive regular personalised updates. Ruairí is an award-winning social innovator, campaigner, writer and speaker. He is a Fulbright scholar, a Presidential appointee to Ireland's Council of State, founder of the pioneering SpunOut.ie youth organisation, and a co-founder of the Uplift campaigning organisation. 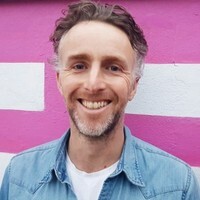 Ruairí is also the host of the chart-topping Love and Courage podcast and a regular contributor to national media on social justice, youth and community issues, civic leadership and wellbeing. Ruairí is self-employed and although he often works on collaborations, his work is independent of any group. He is not in receipt of any state funding or grant aid and therefore community patronage and support is important. Once-off and monthly contributions are all welcome regardless of amount. Other forms of support always welcome including offers of skills, technology, venues, and places for writing and retreats. By investing in his work you are directly investing in promoting lasting people-powered change. Please email with any questions. Supporters are assured or regular updates, and mentions on podcast credits and on social media if this appeals. Sincere thanks to monthly patrons Stephen Kelleher, Megan Brown, Jen Murphy, Eamon Stack, Sophia Duffy, Ronan Branigan, Seamus Hennessy, Richard Lawson, Lorraine Cooke, Ray Magee, Ann Keenaghan, Niall Doherty, Simon Ward, Darragh Doyle, Darren Ryan, and Dermot Curristin. Also, sincere thanks to donors Muireann de Barra, Allyson Lambert, Sinead Keaveney, John Cantwell, Lisa Patten, Sarah Winston, Davy Ward, Seán McKiernan, Karen Ward, Darragh Keenaghan, Dolores Whelan, John Lillis, Lynn Boylan, Jim McKiernan, Ruth McKenna, Eimear Chaomhanach, Eoin Murray, Deborah Erwin, Harry Browne, Emanuela Roberti, Ellen Maynes, Tarinna Terrell and the several anonymous donors.